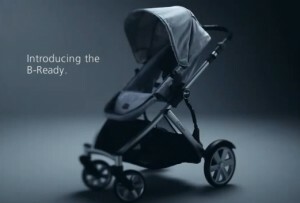 Home » Britax To Introduce Sleek New Stroller: The B-Ready! Next week baby gear giant Britax is introducing a new stroller line thoughtfully designed for parent and child. Designed to grow with your family, the B-READY is a sleek stroller that can be used as a single, double or travel system. In fact it will have 14 different configurations including the option to hold 2 infant seats. Additionally, it had been designed to fold in one piece with the second seat on.